Choosing 3 days/ 2 nights cruise on Unicharm cruise, you will have more time to discover unique scenery of Lan Ha Bay and furthermore explore the pure beauty of Cat Ba island. you will soon forget all the pressure and enjoy your journey to the land of pleasure: wonderful landscapes, fresh and tasty seafood, peaceful atmosphere. This trip surely brings you many joyful experiences. 08:00 – 08:30 optional pick up at your hotel in Hanoi Old Quarter area or in front of Hanoi Opera House. Leave Hanoi for Hai Phong city on the free-way AH 5B enjoying the peaceful landscape of rice field of the Red river Delta. Enjoy driving on the longest sea passing bridge of Vietnam of which front is Cat Ba Island – Huge mountain scene and green mangroves. - 20 minutes on the ferry to Cat Ba Island where you will feel your enjoyment coming by green mangroves running along the mountain feet. After that is the coastal road for amazing views to the bay and the valley shadowed paths through the National Park for more authentic Nature on the route down to the other side of the Park called Gia Luan dock where you can view Halong Bay, the dock for fishing sampans and here we will boat Unicharm Cruise. - 12:30 UniCharm crew warmly welcome you on board. Visit the boat and check in the room and lunch on boat (We can cater Vegetarian or vegan food on your request). - Enjoying the first fresh seafood lunch and cruising among the bay from the back of Halong Bay – Tuan Chau Island to Cap Bai Islet and then Ngon Tay Island (Finger Islet) where you can view the universal seascape of Halong Bay World Heritage such as Sung Sot cave and Titop Island. - On the hidden route for different views of the bay, pass by Ao Ech lagoon (Frog Lagoon) to Ba Trai Dao (Three Peaches). We start discovering the most beautiful and peaceful bay called Lan Ha Bay, the bay with crystal water and round lagoons and the Hon Dua (the Stick Islet). 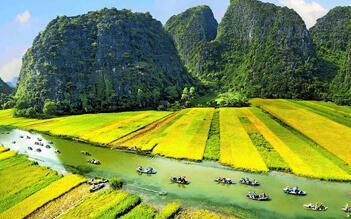 The bay is the additional part of the Wonder of Halong Bay and the World Biosphere reserved area. - Discover the additional part of the Wonder of Halong Bay and the World Biosphere reserved area by kayaking and snorkeling. - On each 2-seat kayak we will paddle through narrow lanes of the karst mountains to visit fishing villages, call on some local fishing families to get to learn more about the daily life of the local fisherman. - Back to the boat for “cooking class” (our tour guide will show you how to make some famous Vietnamese traditional dishes that you can easily demonstrate home for your family after this trip). - Enjoy Dinner and overnight on the lovely peaceful bay once in your lifetime. - Wake up among the smooth waves and karst mountains and fishing villages. - 07:00 AM - Enjoy a snack with special Vietnamese sweet potato cake and tea, coffee. - Cycle or you can walk to Hang Doi (Bat cave) - the home of the park bats focus here. Afterward cycling back to the Cruise. - Visit the Canon Fort. - 12:30 drive to the central of Cat Ba National Park for a moderate trek to Ngu Lam Peak (the trek up and down takes 2.5 - 3 hours). At the summit you will obtain a universal view of Cat Ba Island – Lan Ha Bay and Halong Bay. Triple scenes in your one photo shot! - Kayaking and snorkeling again or you just want to relax or go swimming from the boat. - Dinner and overnight on Unicharm Cruise. - Light snack on board. - 10:00 start cruising pass by the fishing villages and thousands of limestone islands and islets, taking precious Uni pictures and meanwhile enjoying our tasteful brunch. 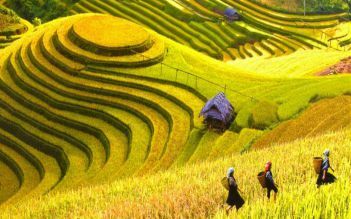 - 12:00 – 12:30 arrival back, say goodbye to the bay and disembark UniCharm Cruise for another drive on the free-way AH5B back to Hanoi. 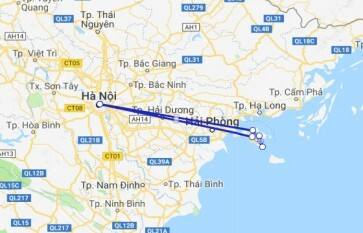 - Estimated to arrive back in Hanoi at 15:30 – 16:00 – end the tour at your hotel. Very well organised and friendly crew. 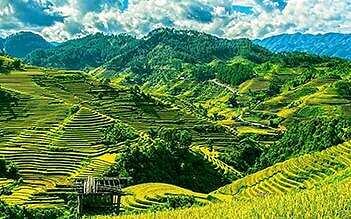 The two nights includes an activity programme of kayaking, trekking in the mountains, cave visit, and bicycle ride to a small village. Highly recommendable. Good food. We had a superior cabin with balcony, great view! The guides really know their stuff. 5G WiFi on the bus transfer. We enjoyed our time on the cruise. The staff were great. The quality of the food and service were very high. We were fortunate to cruise through the Viennese New Year, which meant it was quiet in Ha Long Bay. During peak season there are over 500 tourist boats, which could feel crowded. The boats activities were ok, but the real high light is bobbing along looking at the most amazing scenery. The sea is always calm. The price of the trip isn’t cheap, but it’s very good value. I would definitely recommend the two night cruise. We took the cruise in second week of January. We were travelling with our infant daughter and had a very good time on the cruise. The pickup and drop from Hanoi was in clean buses and entire time was efficiently utilized. As the cruise advertises, they have indeed chosen a route away from the crowded areas. All throughout our journey on the cruise, which was very scenic, we saw very few other cruises, so the entire atmosphere was calm and serene. Kayaking was fund as we did it in a secluded lagoon. While the cruise occupancy was much lesser than overall capacity, it did not at all impact the overall services or activities planned. Vegetarian food options were plenty. Last but definitely not the least, our guide Quang was very helpful, very approachable and just had the right attitude as the tour guide. He added to the overall fun and good time we had on the cruise. This is a nice cruise to tour along the halong bay areas. Besides the $1000/night ship, this is the nicest boat in the bay. The accommodations are amazing for a boat. The food was fine, but not horrible. The tour guide and staff were warm, friendly and informative.